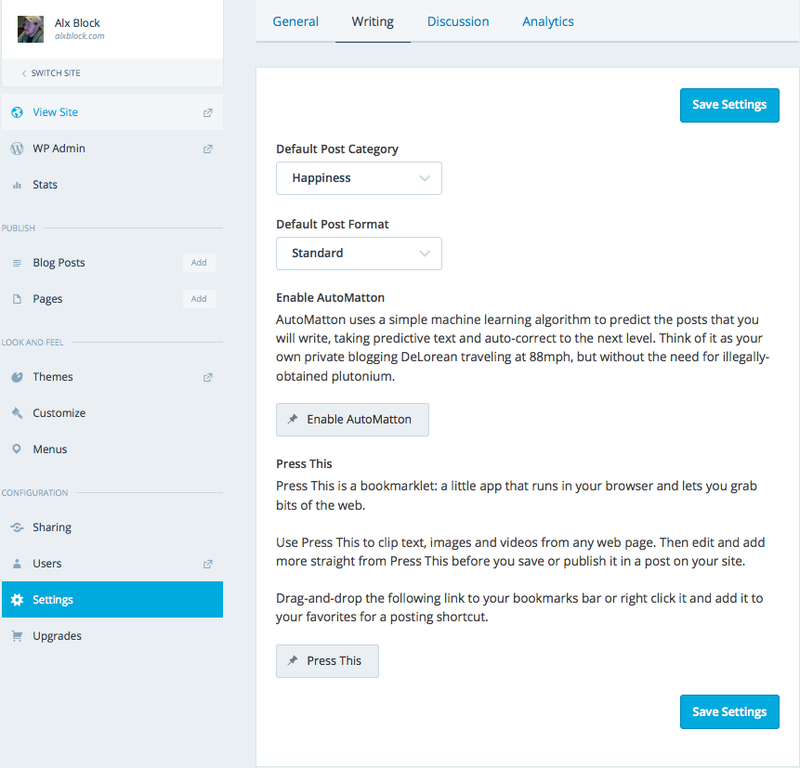 Hassle-free blogging just got even easier. Here at WordPress.com, we‘re always looking for ways to improve the blogging experience. We pride ourselves on taking your suggestions to heart and work tirelessly to create better tools for you. Today, we’re releasing a game changer. AutoMatton uses a simple machine learning algorithm to predict the posts that you will write, taking predictive text and auto-correct to the next level. Think of it as your own private blogging DeLorean traveling at 88mph, but without the need for illegally-obtained plutonium. AutoMatton analyzes all of the posts that you’ve published, Facebook statuses you’ve liked, Google reviews you’ve left, and emails you’ve sent your mother to produce prose that could have been written by you. Written by future you, that is. Amazing! Haven’t written much yet? No worries! AutoMatton will fill in any gaps with text randomly pulled from three-year-old Yelp reviews and Wil Wheaton’s Twitter feed to produce full, seamless posts. I haven’t written anything myself since 2009! You can define the approximate word count as well as the number of images that you’d like to use per post. From there, it’s simply a matter of providing a topic and pouring yourself a cup of tea. Or whiskey. Or whiskey with tea. Once AutoMatton is enabled, you’ll be asked to fill out a short survey and provide some links to your existing social media profiles along with a list of all your living relatives and the password to your Instagram account. From there, just pick a topic for your post and let AutoMatton go to work. In just a moment, it will will generate a title and content and and add your specified number of photos. * All you need to do is click Publish! *Note: all photos will be kittens. Puppy photos will be available in version 1.1. I wrote the entirety of Richards IV through VII using AutoMatton! Never write anything, ever again. To anyone. Being that our roots are within the open source community, we’ll be opening up this code. We hope to see people build on this work to create automated solutions for any type of writing — we see lots of potential! Running late and need to tell your partner? Simply press a button and allow AutoMatton to have that conversation for you. Traffic on the 101 is nuts! On top of that, there was only one small piece of pork in the entire bowl, and the rest of it was shredded and dry. Need to respond to the email from Aunt Rose from two weeks ago? AutoMatton can tell her all about your new job, without her knowing that it isn’t you. She might even send you a snowglobe from her trip to the Grand Canyon for being so nice. Hope you’re having fun in Colorado! I hear it’s beautiful, like Applebee’s with a different name. I wanted to tell you that I got that job at Star Trek: The Next Generation! I start on Tuesday. They’ll never know it wasn’t really you! Enable AutoMatton with just a few clicks! Once enabled, fill out the form to provide the initial data to AutoMatton. AutoMatton will then run in the background generating content by future you. Please note: WordPress.com is not responsible for the results. If you use AutoMatton, feelings of frustration or anger may occur, either yours or that of your readers and friends. Some AutoMatton testers reported dry mouth, fatigue, feelings of helplessness, jealous shinbone syndrome, or an uncontrollable need to laugh during inappropriate situations. OMG! I just got rickrolled! As someone who takes writing and the contents of my blog very seriously, I find the concept of a feature like AutoMatton to be ridiculous and appalling. Identifying relevant topics and drafting the post should be work. It shouldn’t be easy. I don’t want an algorithm to suggest what I post. There. I feel better. Full disclosure: This comment was written without the assistance of AutoMatton or any similar tool. Very funny! And, yes, I fell for it. ^5! Well played…and a rickroll, LMAO! Hilarious! I look forward to future me future reading and future commenting on future blogs as present me procrastinates. Bugger that! Its bad enough robots taking over the medical world, without them taking the words out of our mouth as well! What does rickrolled mean? I assume thats robotic terminology……??? That’s hilarious. I totally fell for it. 🙂 wow. Oh dear, I got pranked. You had me going to about a minute. Doh! But some novelists surely are using this already? Ha Ha! Guessed it but couldn’t resist pressing the bloody button! Love it! Think of the possibilities–on April Fool’s and every day! The new AutoMatton feature in WordPress is super awesome! I have been waiting for something like this for quite a while. I have sold almost all of my assets and worldly possessions including my children’s college funds as well as our medical and emergency accounts and am letting it all ride on your new machine learning tool! Basically I have set up a multitude of WordPress sites all based on AutoMatton. Now that everything is in essence “pre-written” I can really make use of all my free time. Using your advanced algorithmic protocols and my extensive online history of wordsmithery the new posts will not be as good as my own manually written posts might have been — they’ll be better! I’ll neither read them or write new ones again as I’ll already know what’s in them and I’ve no need to try to out do the machine (which is really just me anyway). I’ll be on the beach if you need me! But you won’t need me, will you? No! Steven Hawking, Elon Musk and Bill Gates were wrong – this is nirvana. First I was scratching my head at it. By the end of the article, I remembered the date. One of the best today! Oh my gosh! Love it!!! Thanks for the chuckle!! Nice one. I almoust fell for it. 😀 So I’ll write my novels also in future by myself. I read with interest until the point where you mention “emails to your mother”, my blood curdled with rage and I read no further. I did, and I’m laughing. I do not see the Automatton option on my dashboard. Pardon me, I do not see anything. Just under the post author’s photo, on the left — “April Fools”! When I click on the April Fools tag, I get nothing. Right, “April Fools'” is the indication that this post is a joke — this isn’t a real feature that anyone can access. Thanks, I really feel stupid now. Most amusing April Fools joke I’ve read all day. Happy April Fool’s Day to all at Word\press. That was brilliant! good job pig! Forgot to add, at least it proves that some of us read all you send! It’s April 1st here ………… presume the same there? Haven’t blogged for weeks. Nearly forgot the date! But seriously, I would love an app like that…. it would be great if it could generate thoughtful comments, too. Automattically…..
You had me going there for about a minute. Then i remembered the date! I had to click the enable button just to see what it did. Why did you choose that song? Well you almost had me there, telling you what the heck is the point of blogging then… but I forgot it is April Fools… good one. When I saw the title I went awwwwwwwwwww FFFFFFFFFFFFART someone has managed to bring frickin’ “AUTOTUNE” to the word world. First paragraph was enough to know it was a joke. It wouldn’t be April Fool’s Day today, would it? I’m sooooo glad this is not real! LOL I was so confused!!! I clicked on the ‘Comment’ button to come and gripe about taking away the authentic “voice” of the artist, and technology going too far, and blah, blah, blah…then I noticed all the other comments, and remembered the date (I hate this date for that reason. Lol). Good one! I don’t have this option.. Is this only for the users who’s paying their blog site? No one actually has this option — look at this post’s tag! The Rick rolling was a nice touch. Took me – up until I started googling “Is AutoMatton a real thing?” Seemed very scary and yet very intriguing… Kudos. This made me laugh, almost as much as the article in ‘The Guardian’ about Jeremy Clarkson. Um…good one? Because it’s SO believable, plausible, and valuable. But it was fun to read. Tee hee. I want the puppies version to be developed before I sign up ;). I’m new at this, you almost had me fooled. After the Smashwords foolery this morning, this didn’t fool me at all! Does that make me the AutoMatton for my clients? They think of something they need written and it appears before their very eyes! From the moment I read this I knew it was an April fools joke! Good creative thinking though! Buttons are supposed to be clicked, right? I was halfway through this article and feeling absolutely horrified before I remembered today’s date. Good one. You had me. But I need this to be real! I’m tired of manually padding my posts with Yelp reviews and Wil Wheaton tweets! What an incredible concept. I don’t think we’re too far off though. Seems like gadgets are taking over…I was tempted to try the links and see… Good one! Good one. Glad I remembered it’s April 1st. I actually thought this was real! Very funny—but I must admit ;if you could ever get thing to actually work, I’d be the first to sign up. I agree. Nice April Fool’s Day! I was hoping that the joke was going to be what AutoMatton would write once we enabled it in our site settings. Sadly, no button to push there. Fun prank though. You got me too! Good one! OK, you got me beautifully. Not so far away from April the 1st as we’d like to think sadly. The only thing funnier than this prank is the music video. Wow! As if we don’t think enough on our own? I bought it hook line and sinker hahah! Hahahha, I just spit up on my smart phone. You’re paying for that by the way! I have in the past sent texts that were full paragraphs of autocorrect suggestions just to mess with my girlfriend. Let’s try one here shall we? That was way cleaner than what I sent to my girlfriend. Probably for the best. Great satire my man! This is really obvious but hilarious. So the app ain’t real?! Haha great job!!! Computer geeks would not be so easily fooled.